The Causses du Quercy area was given Park classification on 1st October 1999 by decree of the Prime Minister. Its "Regional Natural Park" designation was renewed in 2012 for a duration of 12 years. Down on the valley floors, water creates fertile strips, whilst on the causses, it disappears and gives way to ground covered with pubescent oaks and dry pastures. Dry, stony plateaux, the causses form the iconic landscape of the Park. 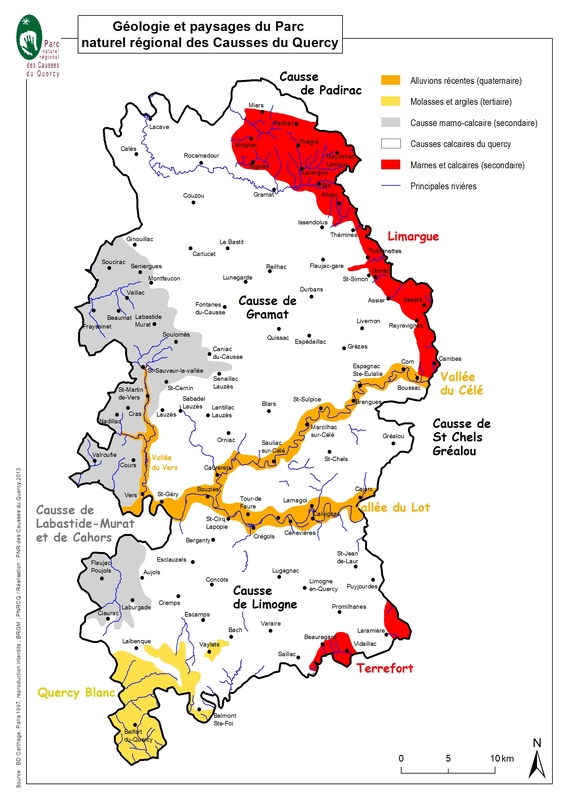 The solid limestone block of the causses is gashed by the majestic, green valleys of the Lot and the Dordogne, and the wilder Célé and Vers valleys, plus the impressive canyons of the Ouysse and the Alzou, and numerous dry valleys or coombs. This limestone bedrock changes towards the east as it comes into contact with the Central Massif, giving way to clays and calcareous marls, creating the wooded verdant countryside characteristic of the Limargue. In the south west, the relief of the Quercy Blanc, more open, undulating country, alternates fertile valleys and arid zones, called "serres", where chalk comes to the surface. But what is a Park ? What is a Regional Natural Park ? a theme park ? a wildlife reserve ? a nature conservation area ? No, a Regional Natural Park is first and foremost an area which has gained national recognition for the quality of its heritage in terms of landscape, buildings, environment and culture. Next, it is an area which has formulated a plan for developing human activities and for preserving its various types of heritage. Finally, it is a group of local authorities (communes, communities of communes, département, region) which have come together to put into practice this plan for sustainable development for twelve years. No, it's not something abstract. A Regional Natural Park is directed by elected local representatives supported by a technical team made up of specialists in various domains (naturalists, hydro-geologists, town planners, economists…). This team advises and helps the communes, communities of communes and also local associations, to elaborate and put into practice their plans. It seeks funding for them. It can also suggest and carry out actions on the scale of an individual site or of the Park area as a whole. To sum it all up, a Park is a brand image for an area and a very useful tool in the service of local authorities. Local and area authorities have committed themselves to the project by signing a Charter, the Park Charter, which defines the challenges facing the area, the objectives to attain and the measures to take in respect of enhancing its heritage, of social, cultural and economic development and the preservation of the quality of life of its inhabitants. The Charter is established for a twelve-year period. It is renewable for the same period after evaluation. Why a hand as a logo ? 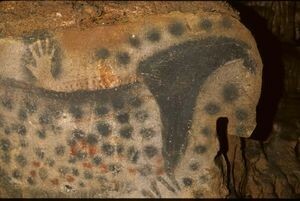 The Causses du Quercy Regional Natural Park's logo is inspired by the hands outlined on the walls of the prehistoric painted cave of Pech Merle, which lies within the Park. This is an image full of symbolism, which can be interpreted as a hand held out between the generations of the past, present and future. 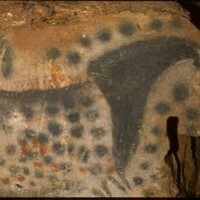 It is a reminder of the central role played by mankind in the Park project.